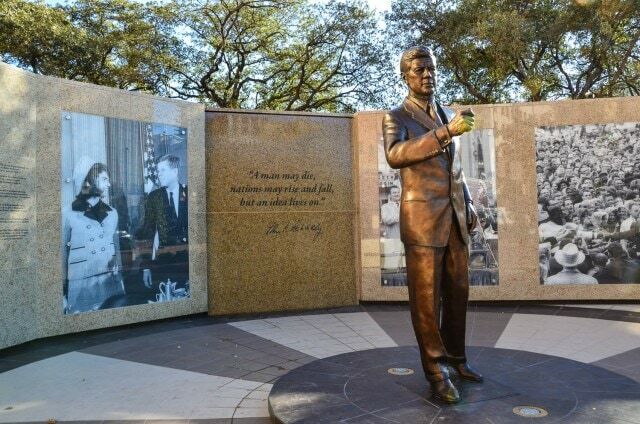 On November 9, 2012, Fort Worth unveiled a tribute to President John F. Kennedy commemorating the city’s place in history as the site of the charismatic president’s last speech. Situated at the southeast corner of Main and 8th Streets, in downtown’s General Worth Square, the JFK Tribute resides approximately where President Kennedy delivered his outdoor address, at the doorstep of the former Hotel Texas, now the Hilton Fort Worth. 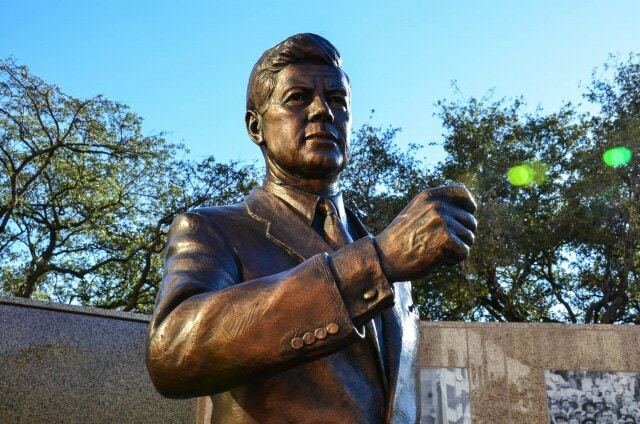 The JFK Tribute features an eight-foot bronze sculpture, created by Texas sculptor Lawrence Ludtke, surrounded by a semi-circle of marble telling the story of the first half of President Kennedy’s final day. On Friday, November 22, 1963, before the assassination that has been the subject of countless conspiracy theories, thousands gathered to hear President Kennedy speak about global economics, national defense, and Fort Worth’s role in aviation history. Perhaps less well known is the story of President Kennedy and First Lady Jacqueline Kennedy’s final night in Suite 850 of Hotel Texas. 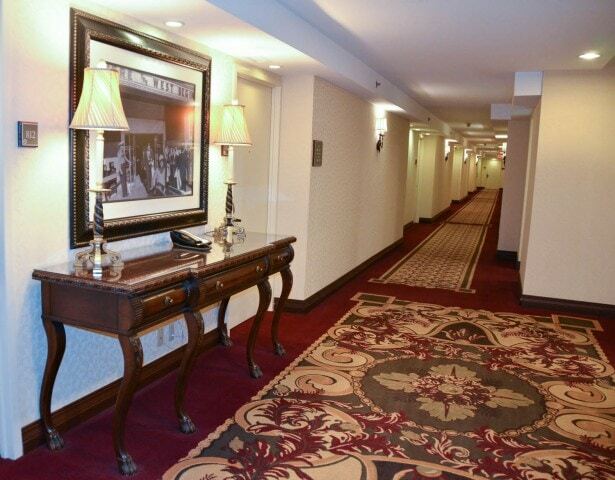 A quick glance at the eighth floor today reveals nothing more than a typical hotel corridor, and as such is not much different than it was on that last night. But on November 21, 1963, a group of prominent Fort Worth residents united to transform an otherwise plain hotel room into an extraordinary experience. Gathering world-class artworks from museums and private collections, Suite 850 in the Hotel Texas was converted into the ultimate private art show with extraordinary pieces such as Pablo Picasso’s bronze “Angry Owl” and Vincent van Gogh’s oil painting “Road with Peasant Shouldering a Spade. Most of the twelve paintings and four sculptures will be on exhibit at the Amon Carter Museum of American Art in Fort Worth from October 12, 2013 to January 12, 2014 in commemoration of the 50th anniversary of JFK’s death. 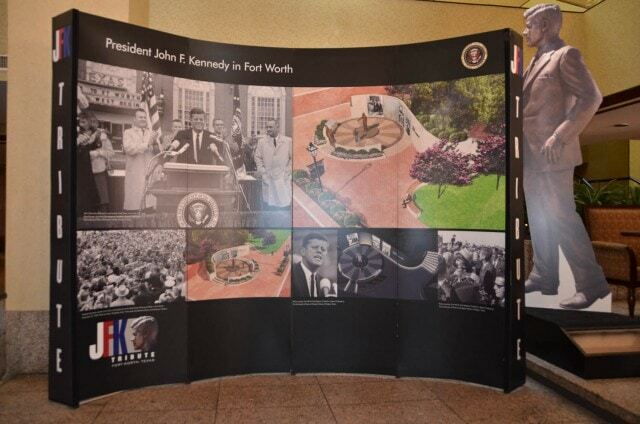 Today, Hilton Fort Worth guests will find several displays celebrating JFK’s legacy. In what was once billed as “the South’s Greatest Lobby,” a JFK Tribute poster greats new arrivals. Upstairs, wall displays illustrate John F. Kennedy’s visit to Fort Worth. One of these displays is located just outside the conference room where President Kennedy addressed a Fort Worth Chamber of Commerce breakfast shortly before heading out on that tragic motorcade to Dealy Plaza in Dallas, Texas. 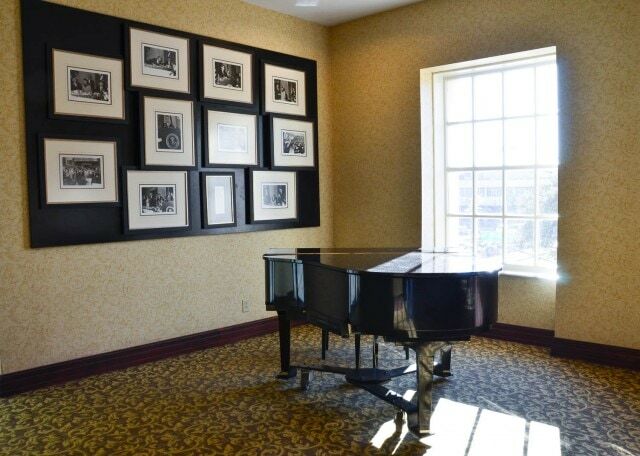 Together, the JFK Tribute and Hilton Fort Worth offer an informational launchpad for exploring the life and contributions of one of America’s most-beloved and influential historical figures. Explore the tributes, museums and landmarks that commemorate the life and legacy of President John F. Kennedy. Stay overnight in downtown Fort Worth at the Hilton Hotel (formerly Hotel Texas) where JFK and the first lady spent their last night together. 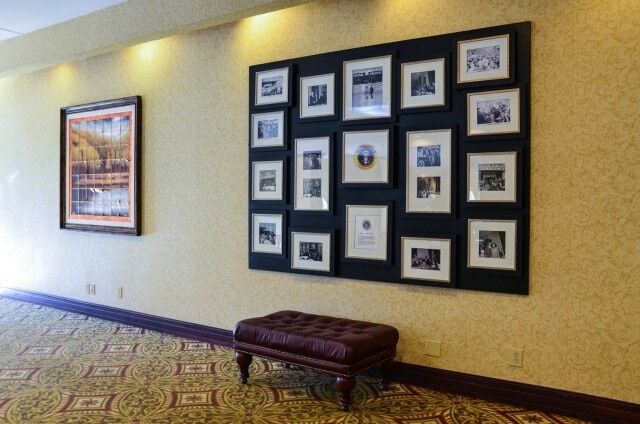 Browse the displays in the Hilton Hotel that detail JFK’s visit to Fort Worth. Admire the JFK Tribute in General Worth Square, including an 8-foot bronze statue, visuals and internet based teaching guides. Hop aboard the TRE (Trinity Railway Express) the commuter train that connects Fort Worth to Dallas. In downtown Dallas, see the Grassy Knoll and visit the Texas School Book Depository and Sixth Floor Museum, all in Dealy Plaza. Catch the TRE back to Fort Worth. End your day in Fort Worth’s Sundance Square, home to museums, shopping, dining and nightlife — all within walking distance of the Hilton Hotel. Before retracing JFK’s footsteps, learn about the 35th President of the United States from lesson plas available through the John F. Kennedy Presidential Library and Museum in Boston, MA. Sorted by grade level, available curricular resources include: a letter from ten-year-old Jack Kennedy to his father, asking for a raise in his allowance; inaugural address analysis; and engaging archival material to foster understanding of history and politics. Explore Fort Worth’s rich arts heritage with a walking tour of its cultural district and a family-friendly tour of the Kimbell Museum. Disclosure: A big thank you to Visit Fort Worth for hosting our stay.